Brass Roli Chawal Silver Plated Thali, exclusive wedding item. 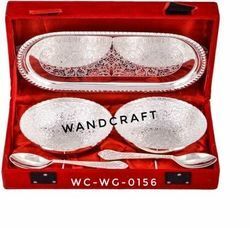 Owing to our years of industry experience and precise knowledge of this domain, we are offering an outstanding assortment of Silver Plated Corporate Gift Set. We are the reputed in the domestic market for Manufacturing, Exporting and supplying handicraft made of Silver Plated Diwali Gift. Silver Plated Gifts, Silver Plated Brass Bowl, Brass Silver Plated Gifts. Silver Serving bowl offered are available in designer patterns and classic styled finish. These are offered in variety of designs, shapes, sizes. 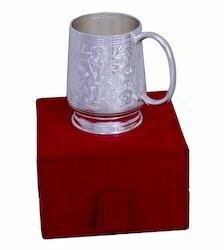 Being a most reliable organization, we are engaged in offering a wide range of Silver Plated Corporate Gift. We are the leading manufacturer of these silver 925 plated gift articles and we offered this in our wholesale price.And this will make in well finished handmade hammer texture exclusive look. Production Capacity : 30000 Pcs. Delivery Time : 20 to 35 Days.